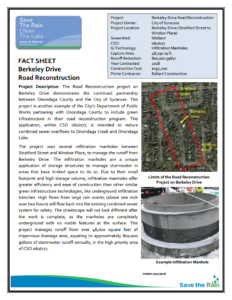 Project Description: The Road Reconstruction project on Berkeley Drive demonstrates the continued partnership between Onondaga County and the City of Syracuse. This project is another example of the City’s Department of Public Works partnering with Onondaga County to include green infrastructure in their road reconstruction program. This application, within CSO 060/077, is intended to reduce combined sewer overflows to Onondaga Creek and Onondaga Lake. 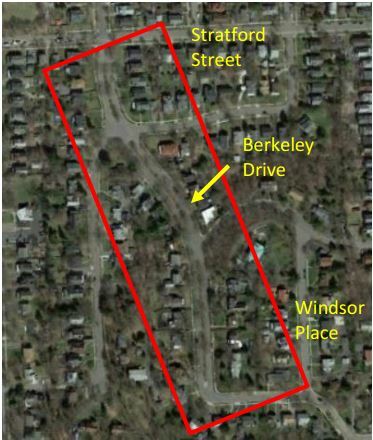 The project uses several infiltration manholes between Stratford Street and Windsor Place, to manage the runoff from Berkeley Drive. The infiltration manholes are a unique application of storage structures to manage stormwater in areas that have limited space to do so. 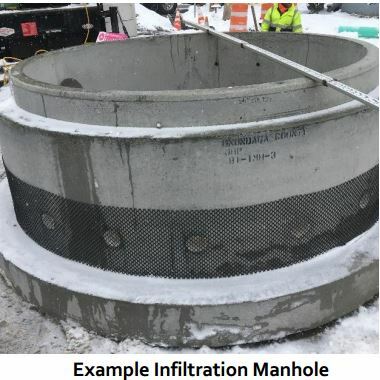 Due to their small footprint and high storage volume, infiltration manholes offer greater efficiency and ease of construction than other similar green infrastructure technologies, like underground infiltration trenches. High flows from large rain events (above one inch over two hours) will flow back into the existing combined sewer system for safety. The streetscape will not look different after the work is complete, as the manholes are completely underground with no visible features at the surface. This project manages runoff from over 48,000 square feet of impervious drainage area, equating to approximately 800,000 gallons of stormwater runoff annually, in the high priority area of CSO 060/077.